Continuing on from the previous post, R1 is in place and, we’re ready to begin weaving a basic 2/2 twill. Make sure R1 ended by going below the #4 pin at Cr4. First I’ll list the pattern instructions. 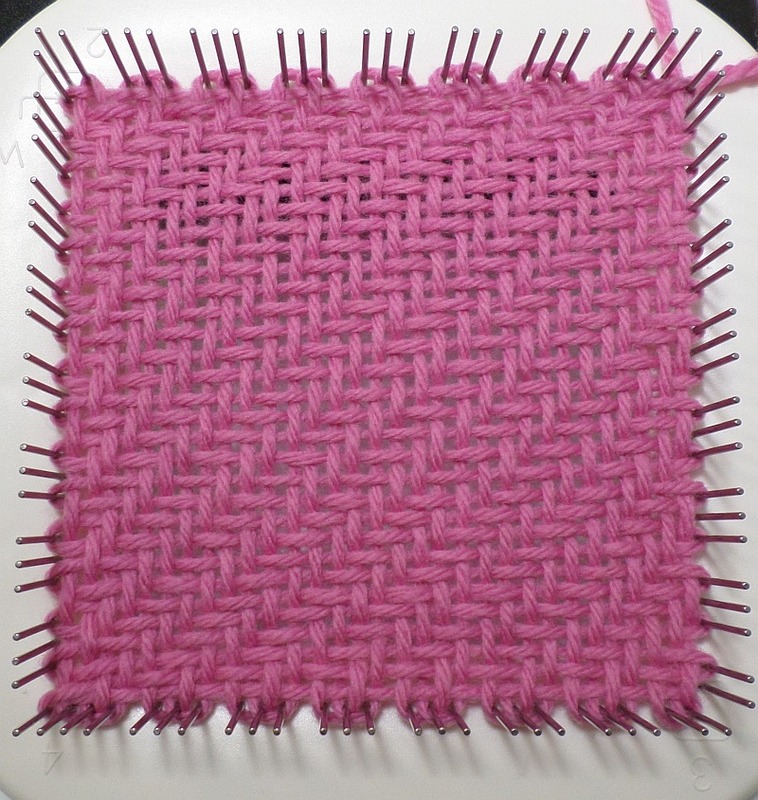 Following those are some tips for weaving this design. 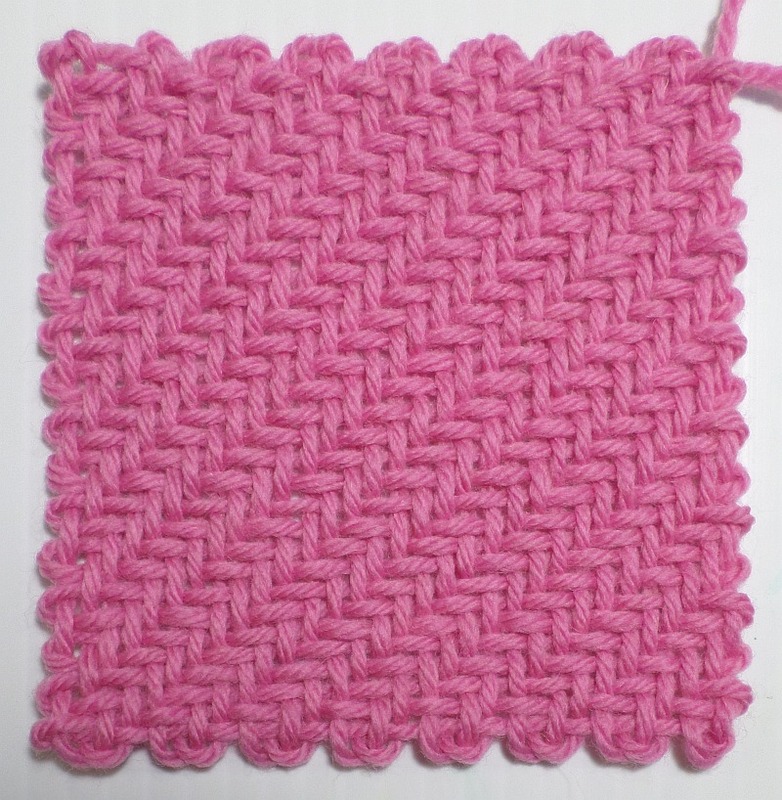 Lastly, there’s a photo tutorial of the first eight rows. Please check out my video series demonstrating the techniques described in these 2LW tutorials. For Optional R32—there’s usually room for this row, so add it if you’d like, although I don’t recommend it if it will interfere with your pattern. 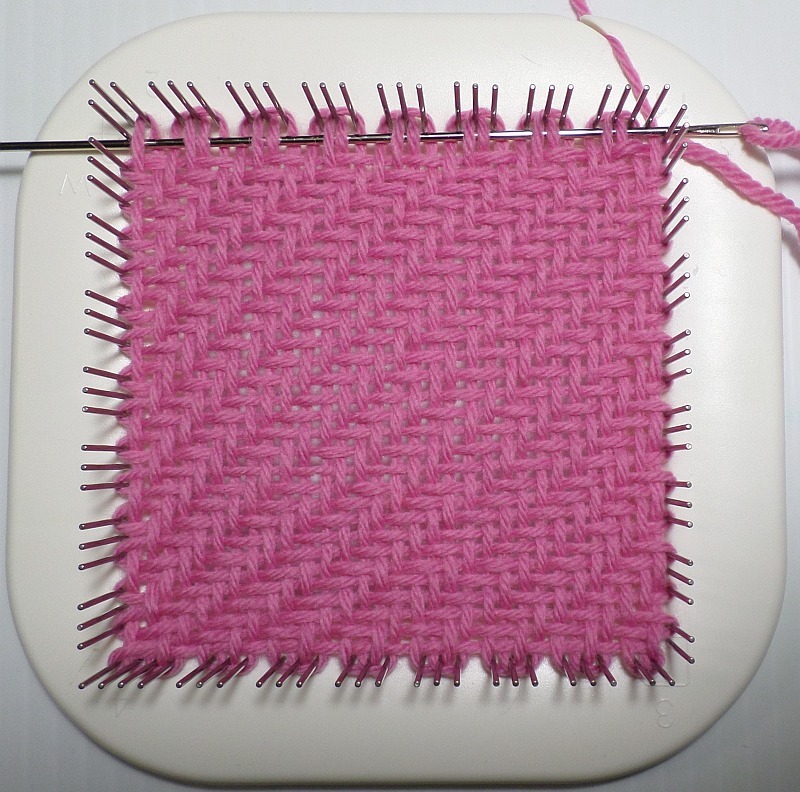 You can either continue the pattern or plain weave (you may need to take two stitches together to get it to work; it seems to work differently every time for me—I’m still experimenting with this row; see below, and next post, for further information). UPDATE: I’ve found, with wool at least, if you warp a little more snugly there really is no need for that 32nd row. AFTER R1 and R2, you’ll be repeating R3-6. 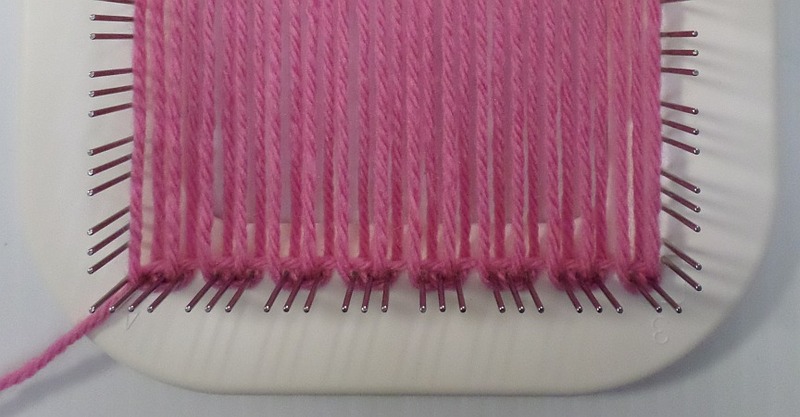 The odd rows (1-3 side of the loom) always start with either U2 or O2 (it will be obvious whether or not to go O or U). 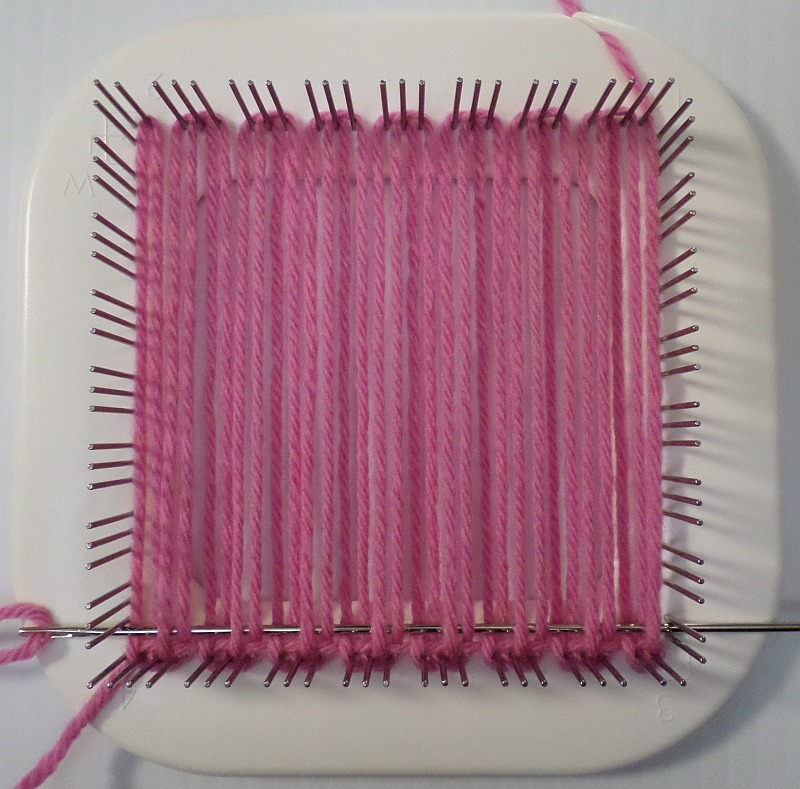 The even rows (2-4 side of the loom) always start O1, U1 or U1, O1 (P2). Again, it will be obvious when to go O or U. After weaving R31, it looked like this square could easily accommodate another row (see second photo at the top of this post), so I added a 32nd row. The third part in this series will cover changing directions in the basic 2/2 twill.